I have been wanting to review this book since October, but like every year, I'm thrown the reality curveball from teaching high school English. No matter how much I want to read and review, I'm always swamped undeneath a pile of essays to grade. But, thankful for Thanksgiving break, I can take a moment, take a breath, and review this amazing book. When I first received the book in the mail, I was a bit overwhelmed at the sheer magnitude. Putting myself into the mindset of a teen, I thought to myself: if I saw this on the shelves, would I pick it up? The average teen probably would not, but here are a few reasons why he/she would if taking the time to pick it up off of the shelf. First, you will notice on the cover that this is the first book of a new series, which is always enticing for readers. Since Twilight, young readers (and let's be honest, adults) have been clamoring for the next big series. While The Hunger Games has just ended its film run, and the Divergent series will end soon, readers are hungry for something to hold onto. And this just may be the answer. Second, have you flipped through the pages at all? They are beautiful. A mix of computer instant messages, confidential files, prose, artistically created pages, etc., the book is definitely catering to a reader who would be overwhelmed by just looking at the book's size. Because of the variety of text, the book doesn't take very long to read. A "reader" will probably finish the book in just a few days and have to find something else to occupy some time waiting anxiously for the sequel. But let's move past the "look" of the book and talk about the content. No matter how "pretty" a book is, the content, the plot, the characters, the story will carry a reader through to the end. Kady and Ezra used to date, but like most teen relationships, it just didn't last. Once their colony is attacked, Kady and Ezra are safely evacuated, but not to the same place. Kady is sent to Hypatia while Ezra is sent to Alexander. On Alexander, Ezra puts all of his effort into becoming a pilot, while on Hypatia, Kady uses her hacking skills to see what the other ships are doing. Personally, I love Kady. Her humorous defiance is refreshing, though reminiscent of Katniss Everdeen (but there's nothing wrong with that), and I was more inclined to read her excerpts than Ezra's because of her spunky persona. While Kady is hacking into another ship's system, she reconnects with Ezra. Hesitant at first to talk with him again, she realizes that the information she has found is more important than some silly love story. I won't go into detail here, but I will tell you that this information involves artificial intelligece and a plan to the change the world as they know it. Like most YA novels out there, a love story does have a thread throughout the novel, but it's not overwhelming and it's not inauthentic. You will root for Ezra and Kady, not just to be together, but to save the world. An explosive new series that is perfect for science-fiction lovers, romance lovers, YA lovers, graphic novel lovers. 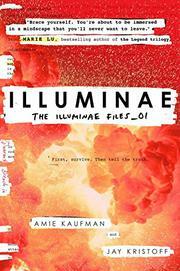 If you are any kind of reader, you will love Illuminae.